I put a chair in the woods. It is one of those folding chairs meant for camping. I searched a while for the right spot, one that wouldn’t be visible if someone happened by. Though no one really goes back there. I’ve run into an old guy walking his dogs but that’s it. The chair isn’t far from a convenience store called Speedy Stop. It feels, when you’re in the chair, like you’re way out it the wilderness. Maybe weekly. It depends on the weather. In the summer it’s too hot unless I get there early. – How long do you sit there? Depends. I read most of a book there once. Sometimes just a few minutes. I ride my bike. It’s a couple miles from my house. I don’t know. It’s weirdly pleasing. It would be less pleasing if the chair was on property that I owned. Then I would just be sitting outside. This feels like I have claimed a patch of earth on the sly. I pass No Trespassing signs on the way there. It feels mildly illegal. – Has anyone else found the chair? Not as far as I know. It has never been disturbed. I place a twig in the seat with the idea that if someone else sits in it they will remove the twig. The twig remains. – Were you a happy child? 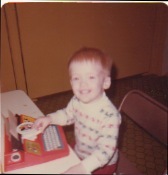 I was not an unhappy child. I made friends. I had interests. I had parents who loved me. I was warm, well-fed and generally liked. – What is the first thing you remember? I remember eating a banana with a brown spot and worrying that it would make me sick. Afterwards my stomach hurt though I don’t know whether that was because I thought it would hurt or if the banana was actually bad. – Since then, how has everything gone? Pretty okay. I am surprised that I am as old as I am. 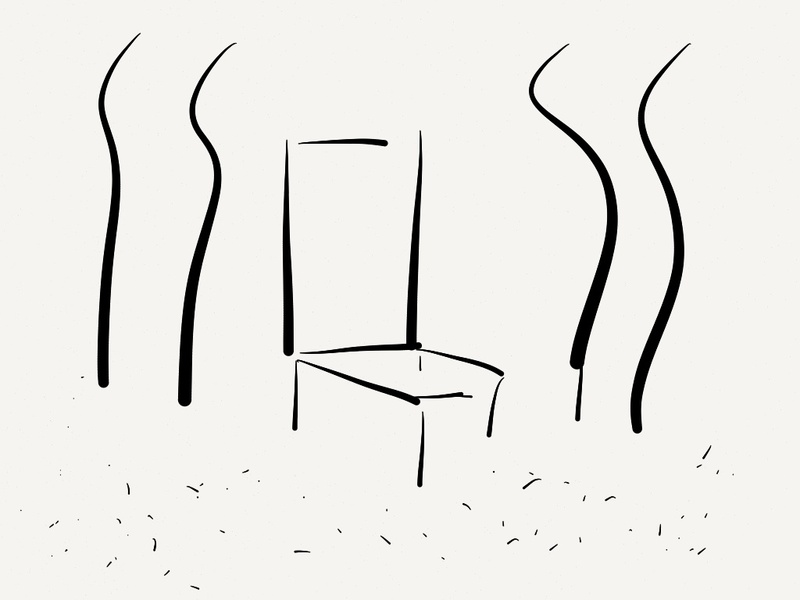 – Does the chair have a cup holder? Two, in fact. One on each arm. – While sitting in the chair have you experienced any epiphanies? – What do you think about while you are there? Lots of things. My mind wanders and flits. Sometimes I close my eyes. – How much money do you have in your checking account? – Do you ever move the chair? I didn’t for months. I found a nice spot under a tree, hidden from view. But the mosquitoes got too bad right there and I had to move it. 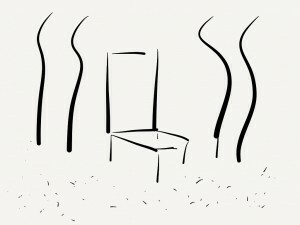 – Is there some deeper meaning to the chair? – Do you believe in an afterlife? An afterlife is as hard for me to imagine as a beforelife. – What color is the chair? The canvas is beige and the frame is black. – Does the seat fill with water when it rains? It did but then I poked a hole in the thin fabric of the seat to create a drain. – What did you use to poke this hole? The tip of a pocket knife.